Shia (/ˈʃiːə/; Arabic: شيعة‎) Muslims make up the majority of the Iraqi population, with 70% of Iraqis identifying as Shia Muslims. Shia Islam has a long history in Iraq; the fourth caliph of Sunni Islam and the first Imam of Shia Islam, Ali ibn Abi Talib, moved the capital of the empire from Medina to Kufa (or Najaf) two decades after the death of Muhammad. Iraq is the location of the holy cities of Najaf and Karbala, pilgrimage sites for millions of Shia Muslims. Najaf is the site of Ali's tomb, and Karbala is the site of the tomb of Muhammad's grandson, third Shia Imam Husayn ibn Ali. Najaf is also a center of Shia learning and seminaries. Two other holy sites for Twelver Shia in Iraq are the Al-Kadhimiya Mosque in Baghdad, which contains the tombs of the seventh and ninth Shia Imams (Mūsā al-Kādhim and Muhammad al-Taqī) and the Al-Askari Mosque in Sāmarrā, which contains the tombs of the tenth and eleventh Shia Imams (Ali al-Hadi and Hasan al-‘Askarī). Since 2003, there has been sectarian violence between Shias and Sunnis in the country. After being named caliph in 657, Ali established his capital at Kufa in present-day Iraq. He and six more of the 12 Shia Imams are buried in the Shia areas of Iraq. Shia Islam always had been strong in Mesopotamia, and Iraqi Shia preachers converted the Persians. The Shia Safavid dynasty declared Shia Islam the official religion of Persia in 1501. The Bani Sallama, Tayy and al-Soudan in the Mesopotamian Marshes were converted from Sunni to Shia by the Musha'sha'iyyah dynasty. Banu Khazal was converted from Sunni to Shia during the early 18th century. Banu Kaab (including its Khazraj section) was converted during the mid-18th century. Since the late 18th century, most of Iraq's Sunni Arab tribes converted to Shia Islam (particularly in the 19th century). During the 19th century, the Ottoman Empire instituted a policy of settling the nomadic Sunni Arab tribes to create greater centralization in Iraq. The tribes adopted a sedentary agricultural life in the hinterlands of Najaf and Karbala or traded (and interacted with) the residents of the two cities. Some Sunni Arab tribes converted to protest their treatment by the Sunni Ottomans. Shia missionaries from Najaf and Karbala operated with relative freedom from the Ottoman Empire, and could proselytize with little official hindrance. The conversions continued into the 20th century, as the British noted in 1917. Many Iraqi Shia are relatively-recent converts. The following tribes were converted during this period: some of the Zubaid, Banu Lam, al bu Muhammad, many of the Rabiah (including al-Dafaf'a, Bani Amir and al-Jaghayfa), Banu Tamim (including the Bani Sa’d, their largest group in Iraq), the Shammar Toga, some of the Dulaim, the Zafir, the Dawwar, the Sawakin, the al-Muntafiq confederation, the Bani Hasan (of the Bani Malik), the Bani Hukayyim, the Shibil of the Khazal, the al Fatla, the tribes along the Al-Hindiya canal, and the five tribes of Al Diwaniyah (Aqra’, Budayyir, Afak, Jubur and Jilaiha) which relied on the Daghara canal for water. The Shia opposed Mandatory Iraq and its Sunni monarchy. 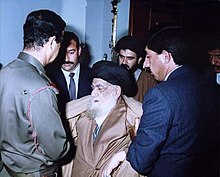 Ayatollah Abu al-Qasim al-Khoei is brought in front of Saddam Hussein after Shia uprisings in 1974. For many years "Arab nationalism and party politics superseded" Shia unity in Iraqi politics, and Shia ayatollahs were not politically active. Shia were generally less well-off economically and socially, and supported leftist parties. In 1963, when the Arab-nationalist and socialist Ba'ath Party seized power in a coup, 53 percent of its membership was Shia. The Shia were shunted aside (by 1968, only six percent of the Ba'ath party were Shia), and turned back to the ulama for leadership. Due to discrimination by the Sunni government, the Shia became increasingly disaffected during the 1970s. al-Dawa ("the Call"), a political party dedicated to establishing an Islamic state in Iraq, was formed. Religious processions during the Mourning of Muharram in the shrine cities turned into political protests. Five members of al-Dawa were executed after riots in 1974, and in 1977 eight Shia were executed after more riots. The Iranian Revolution intensified unrest and repression. In June 1979, Ayatollah Muhammad Baqir al-Sadr was arrested and placed under house arrest. Less than a year later, after an attempt to assassinate Saddam Hussein, Sadr was executed. In 1982, the Supreme Council for the Islamic Revolution in Iraq was formed in Iran by Iraqi cleric Mohammad Baqir al-Hakim as an umbrella group to overthrow Iraq's Sunni-dominated regime. In Iran, Hakim attempted to unite and co-ordinate the activities of al- Dawa party and other major Shia groups: Peykar (a guerilla organization similar to the Iranian Mujahideen) and the Jama'at al 'Ulama (groups of pro-Khomeini ulama). The Baath leadership made a determined effort to gain support from Iraqi Shia during the 1980–1988 Iran–Iraq War, diverting resources to the Shia south and emphasizing Iraqi Arabness (in contrast to Iranian Persianness) and the historic struggle between the Muslim Arabs and the Zoroastrian Persians in propaganda. Iraqi propaganda used symbolic keywords such as Qādisiyya (the battle in which Muslim Arab armies defeated the Persian Empire), and Iranian propaganda used Shia keywords such as Karbala. The Baath government executed about 95 Shia ulama, many of them members of the al-Hakim family, in June 1984. After the US-led 2003 invasion of Iraq, sectarian violence between Shia and the Sunnis steadily escalated. By 2007, the United States' National Intelligence Estimate described the violence as a "civil war". [full citation needed] During the 2006–2008 sectarian violence, tens to hundreds of thousands of people were killed (mainly Shia civilians) and at least 2.7 million were internally displaced. Najaf was the center of opposition to British rule. Shia activists from the city opposed the communist threat in the 1960s, and the Baath regime (dominated by Sunnis) since 1968. ^ Iraq. CIA World Factbook. ^ "Mapping the Global Muslim Population: A Report on the Size and Distribution of the World's Muslim Population". Pew Research Center. October 7, 2009. Retrieved 2011-01-28. ^ a b Stephen Longrigg, Iraq, 1900 to 1950 (Oxford, 1953), p. 25. ^ Lorimer, Gazetteer, 2B:1273; Great Britain, naval intelligence division, geographical handbook series, Iraq and the Persian Gulf, September 1944, 379–80; Great Britain, office of the civil commissioner, The Arab of Mesopotamia, Basra, 1917,6. ^ Amira Howeidy (2–8 March 2006). "There is ethnic cleansing". 784. Archived from the original on 12 October 2010.